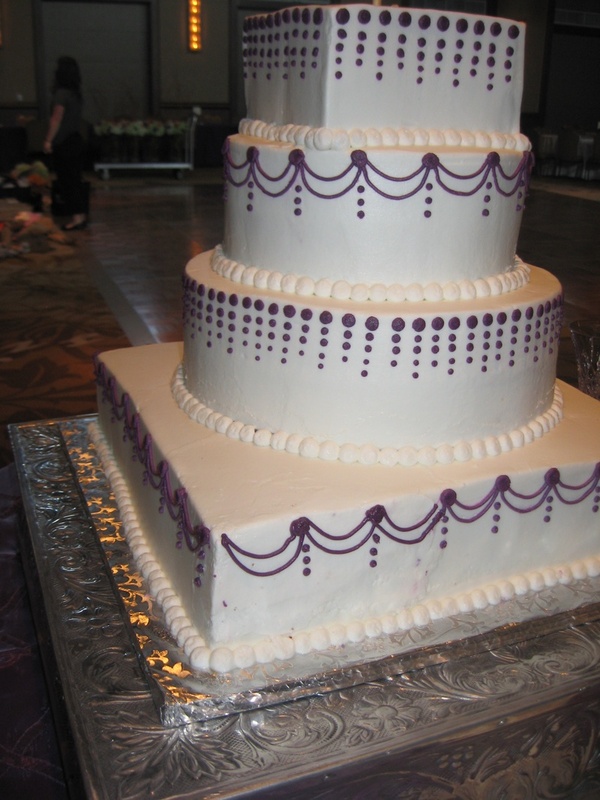 Wedding Cakes - Shimmy Shimmy Cake! The groom opted for a non-traditional "cake" since he doesn't actually like cake. 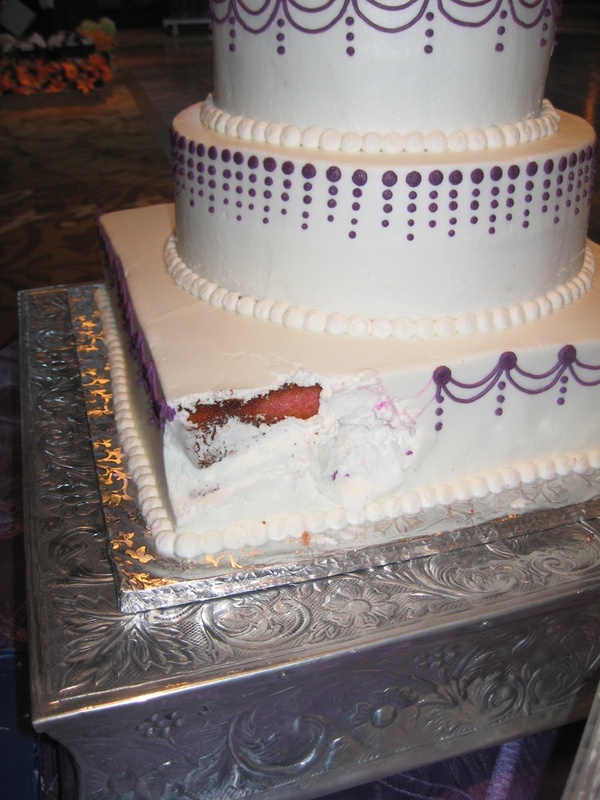 The problem: The groom wanted Oreo cookies instead of a groom's cake. The bride wanted something stylish. The solution: Oreo cookies stacked to look like a cake. I have to admit I did not come up with this idea, it was actually the bride's idea. Each tier had 7 layers of Oreo cookies. 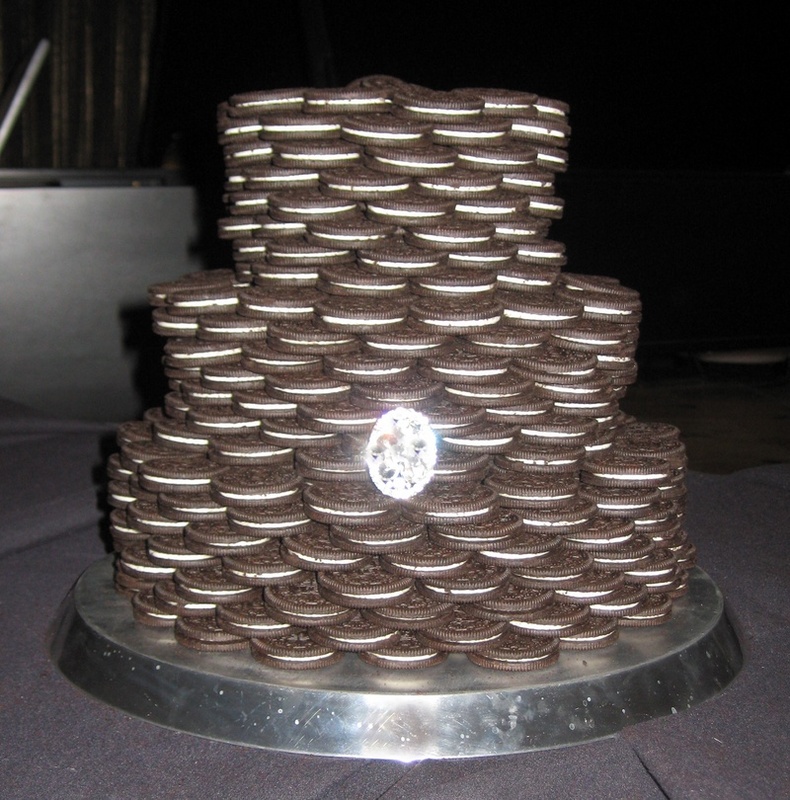 It took 4 3-pound boxes of Oreos from a wholesale warehouse to complete this "cake". The cookies arrived late on the scene, but with 2 bridesmaids plus myself, it only took about 15 minutes to assemble. I tried to straighten it, but if you've ever played Jenga, then you know how difficult that is to do. The cookies were served with a glass of whole milk and I heard they made for some adorable pictures. Such a great idea for an alternative Groom's Cake. 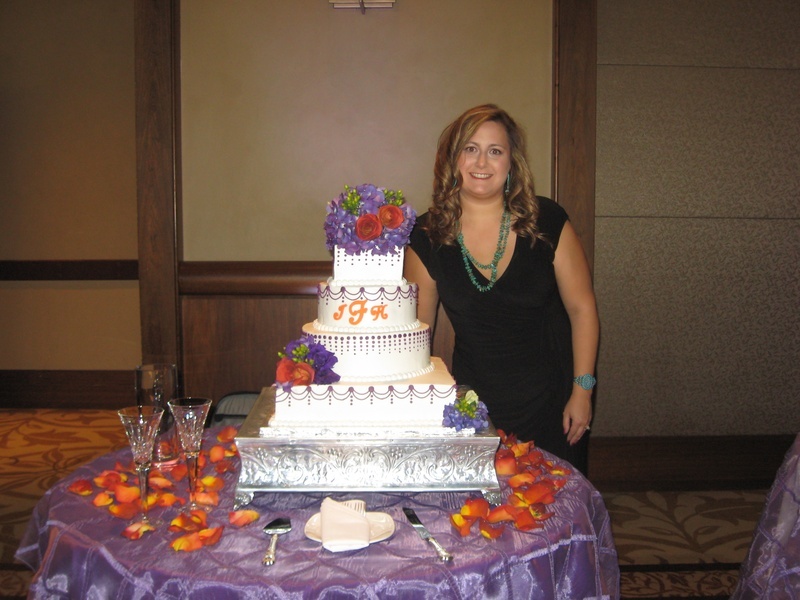 I was absolutely honored to not only make Justin and Haylie's wedding cake but have the opportunity to attend the wedding as well. Although they live 2 doors down from me, we didn't necessarily start out on the right foot. Haylie's sweet cocker spaniel, Tucker, (who is blind) accidentally got out and was chasing one of my kids. I got upset, slammed the door , and am embarrassed to admit this but I screamed some obscenities at her. I'm not the kind of person to think before they speak...obviously! So after I had cooled down, I walked over to Haylie's house to apologize at the same time she was walking to mine with a card she had made for me. A few years later, our HOA elections got extremely heated and I asked her if she had been watching what was being posted to the message boards. We decided to get out our lawn chairs, break out the popcorn, and pop a bottle (okay a few bottles) of wine while waiting for the next nasty message to pop up. After our wine-induced Real Housewives of GO evening, we both realized we had a lot in common and it was easy to see that we would grow to become good friends as well as neighbors. Thank you so much Haylie and Justin for allowing me to be a part of your special day! Wanted: One cake delivery boy, experience preferred! Congrats to Erica and John! A few months later, Erica announced that they were running off to Florida to get hitched on the beach in July. I was a little sad that I wasn't going to be there to witness it (but more so because I wanted to make her cake). Yes, I'm that selfish. Maybe it was me pestering her, or maybe she just wanted to have a killer party, but she did end up throwing a fabulous party to celebrate their marriage. When we were party planning, she said I could do anything I wanted to do. At first I was thinking this would be the most awesome assignment ever. I sketched a few designs and tried to think of something she would like. All I could come up with was birds. Birds are a popular wedding theme right now and I've seen them in lots of magazines (and of course who could forget Sarah Jessica Parker's birdsnest in her hair in the SATC movie)! So I not so confidently presented her with a modern design of two love birds and large J + E monogram. She didn't go for it. She wasn't sure what she wanted and I was scared to go back to a blank slate so I showed her a picture of my favorite wedding cake at the moment (kinda like a favorite song at the moment... which I tend to switch out about every week). She fell in love with it just like I had....I knew we were good friends for a reason! 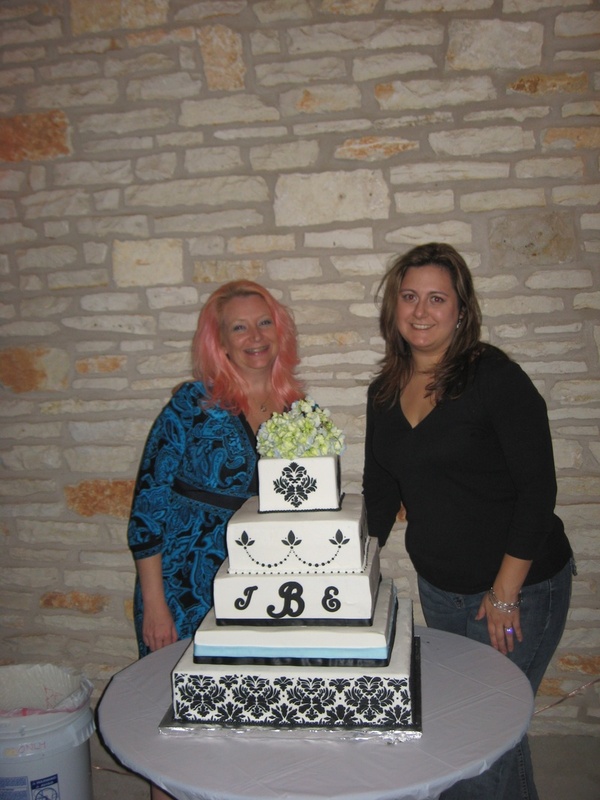 So we went with a damask theme, scoured the internet for cake pictures, and took little bits and pieces from several that we liked to create one uniquely beautiful cake designed for a uniquely beautiful bride like her.